My first order from Hautelook arrived a few weeks ago. I ordered a few 100% pure items that were on sale. I wanted to get the entire organic collection of lip butter as 100% Pure have now changed the ingredients in the new formula and they are more pigmented and no longer organic. They still have the original organic ones on their site until they sell out so be sure to check the ingredients and order the organic ones if you decide to place an order. I did a previous review of the ingredients in 100% Pure products and included these lip butters. Another reason I wanted this collection was for the gorgeous tins. I know that the product is the most important but I'm a sucker for very pretty packaging and I figure if I ever make my way through all of the butter I will reuse the tins with my own homemade butters. Is that not crazy or what? While I would have never purchased them at full price, this was a savings of $107.00! They came wrapped in navy and white paper with a Hautelook sticker and everything was individually boxed in nice plain reusable white boxes. The pencils were in a nice bubble mailer and while it has 100% Pure logo, I will also reuse this envelope for seed trading. The 4pc set (Pomegranate, Peach, Cranberry & Strawberry) is just gorgeous! I love the retro style tins and the large matching tin. The butters are very nice, but honestly they have an odd scent sort of like a stale fruit roll up. The peach is the only one that has a true scent but still has an odd undertone. They are still very nice and quite balmy. The three piece set (Watermelon, Cherry & Raspberry) is also very pretty with the same tins as the 4pc set, they came separately and not in a larger tin, there was also little description card. The Watermelon is my favorite and is true to scent, the others are similar the the ones above, they all smell somewhat the same. The lip pencils (creamsticks) are more like a creamy lipstick in pencil form rather than a firmer lining pencil. The three colors are very neutral and somewhat similar. 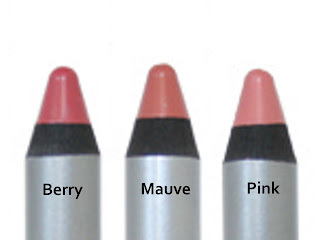 Perfect Berry is the darkest and has a plum-berry tone, the Perfect Mauve is the most neutral and matches my lip color, the Perfect Pink is also neutral and has a little more pinky-rose than the others. While I will probably never get through all of this, I am pleased with the purchase and the price was awesome. Watch Hautelook daily for more great deals and 100% Pure still have the "old style" balms available, probably for a limited time so if you want to try these with the organic ingredients then you should visit them soon.